40 :( OUCH!!!! Actually she earned many of them.....glad to hear some lil ones still enjoy them, they're all so cute. I still have some Beanny Babies in their boxes from wayyyyy back. Hey girl!! You are so welcome.. :) You are going to love the Red Rocker candies.. YUMMY!!! 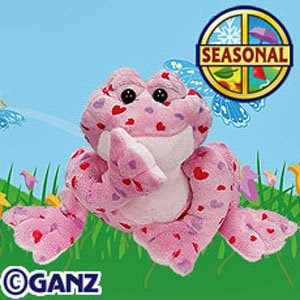 Anyway, this webkinz is SOOO Adorably sweet! LOL, if you want more you can have ours! My kids barely played online with them! Paige just uses hers as another stuffie!! Have fun and enjoy!!! Oh my girls are totally into these as well - and it's all my fault cause I started it! Dummy Mummy!